Dress to impress this lunar new year with these auspicious luxury watches whose canine-inspired features celebrate new beginnings and unforgettable moments to come. The latest limited-edition collection from Breguet pays a playful tribute to the lunar zodiac sign of the year with the unveiling of the Breguet Classique 7145 Chow-Chow model, limited to only 8 pieces. The special edition watch boasts a silver-gold dial with a hand-engraved guilloche pattern of the lovable chow-chow dog breed peeking out from a case of white gold, housing an extra slim self-winding movement that's visible through the sapphire crystal caseback. More information about this adorable collector's timepiece can be found here. Minimalist and inescapably poignant, Piaget’s Altiplano Chinese Zodiac watch is limited to 38 pieces, each featuring a hunting dog motif in a soft gray cloisonné enamel dial, the laborious artistic process of renowned enamel artist Anita Porchet. The frame for this beautiful picture is a sparkling bezel (set with 78 diamonds) on a case of white gold. Find out more about this collection at int.piaget.com. Renowned Japanese artist Kiichiro Masumura’s masterful craftsmanship graces the dial of Chopard’s limited-edition L.U.C XP URUSHI, capturing the image of the Akita, a well-loved breed in Chinese iconography. Beneath this fine lacquer work, a mechanical self-winding L.U.C Calibre 96.17-L is housed in a case of 18-carat rose gold, a winning contrast to the deep tones of the watch's hand-sewn alligator leather strap in black. Click here for more details. This year’s Chinese Zodiac-inspired timepiece by Vacheron Constantin garners well-deserved admiration: a pink-gold engraving of a dog rests gracefully on its floral printed dial of bronze Grand Feu enamel. The hands-free dial displays the time via 4 apertures indicating the day, date, hour and minute. There are only 12 models made of this artful timepiece from Vacheron Constantin’s Métiers d’Art collection. For more information on this elusive timepiece, click here. Rooted in ancient Chinese culture and built to the timeless standards of Swiss watch-making, this limited edition watch by Blancpain boasts a versatile dial that features the main indications of the Chinese calendar – double-hour indication, days, months with leap months indications, signs of the zodiac along with the 5 elements and 10 celestial stems - all juxtaposed with elements of the Gregorian calendar. The zodiac sign proudly displayed under the 12 o’clock aperture corresponds to the year 2018 with a small dog icon. Each of the 50 pieces in this collection also boasts an engraving of a dog on the white gold oscillating weight easily seen through the watch caseback. Limited to 88 pieces, The Ulysse Nardin Classico model uses the intricate Champlevé chiselling technique to recreate the lively image of a dog frolicking against a stunning backdrop of dark sky and subtle landscape features in variously coloured enamels. 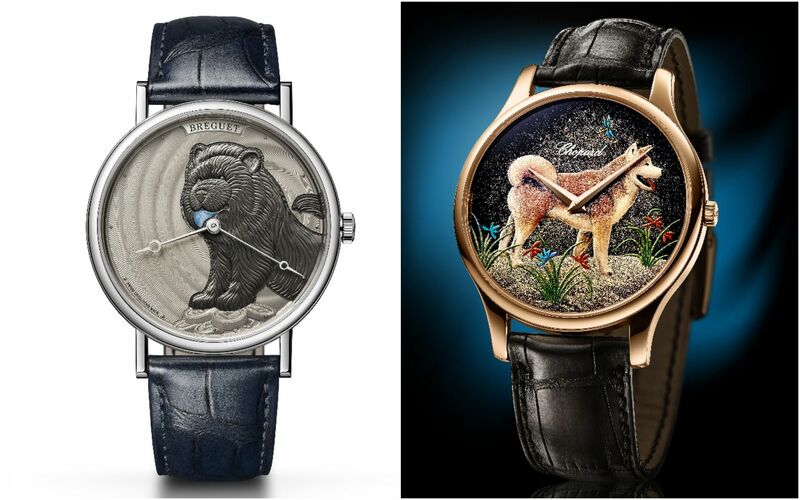 It’s no surprise that Ulysse Nardin has perfected the craft of enamel artistry over a period of 30 years, and this expressive ‘Year of the Dog’ model set in a case of 18-karat rose gold carries that tradition till today. Panerai’s Luminor Sealand special edition model is the 10th in a line of watches exclusively created in commemoration of the Chinese Zodiac. The steel watch cover in this edition displays a regal motif of a dog surrounded by plum flowers, engraved using an ancient technique called ‘sparsello’ that involves the use of gold threads carefully fitted in layers within the grooves of an engraving. This extraordinary detail and craftsmanship is maintained across the 88 pieces in this special edition collection. Find out more here.